AimprosoftBlogAll ThreadsHybris VS Salesforce VS Shopify. What to choose for your e-Commerce project? Here is the truth: many in the e-Commerce industry pursue a number of objectives choosing a new platform for online retailing. It may be a customer acquisition augmentation by the online piece of the pie, a substitution of outmoded poor-featured software, striving for market expansion, putting into action an omnichannel strategy or just launching a new business focused on the online operational management. There is a myriad of e-Commerce solutions on the market for small and midsize businesses. However, owners of enterprise-level businesses are limited (for better or for worth) with a dozen of worth platforms. Both are at the crossroads and confront with a dilemma about what path of achieving the goal to choose, follow best practices or innovate, predict and invest in proven large systems or try the concept with a low-cost solution, whether they have enough resources of time, money and human to reach your strategic goals. Customers involved in the e-Commerce quite often waver between three major platforms of modern online merchandising industry Hybris vs Salesforce vs Shopify. Each of them is progressive, self-sufficient, and profitable. Why so are entrepreneurs faced the choice which of them to favor? Let’s elaborate more extensively on these three and see how they compare against one another. What platform to choose for your e-Commerce project? Let’s say your business objectives are related to the continued steady growth with opening new units for a definite period, disrupt with unexcelled in its fit customer service and put users in the heart of your product or service, or you have already come up in the world of retailing on a local scale basis and are thrilled to start off the international market expansion. E-Commerce platforms, whatever their goals, should be run through the following checkpoints prior to being favored. If your overreaching goal is to improve a customer experience (CX), you should rivet your attention on the tools relating to the advanced search of goods, client service (online support via live chat, socials, call center, emails), customer segmentation, sales channels integration, loyal programs and other functionality that aims to set up an overwhelming control over the CX. SAP Hybris is honed for omnichannel needs both B2C and B2C clients, while Salesforce Commerce and particularly Shopify are far away from the ideal omnichannel vendor. We are interested in e-Commerce systems entrepreneurs prefer to work with not only for the sake of comparing. We want to keep pace with the rapid changes in the digital retailing far beyond values of Hybris. Learn more about Hybris Commerce benefits for your business. Prior to embarking on the searching the perfect e-Commerce solution, we recommend you to make a spreadsheet with all desired features according to the business objectives and define for yourself which of them are affordable and which can result in the overhead. It may happen you do not need B2B focused features of Hybris so there is no sense to buy the subscription. However, the simplicity of Shopify with a basic set of features for a quick start and responsive community will do a good turn. Faltering between pricing schemes, be vigilant when budgeting for your e-Commerce platform. There some traps can lie in wait for you with a subscription, payment gateway fees, or license. Expecting pure pricing scheme, you can lose fact of peripheral costs. For example, enterprise Salesforce has a quote-based calculation which also includes a sales income percentage. Salesforce, Demandware former, offers services for customers with a $20 million turnover yearly. A subscription for enterprise-level e-Commerce resources starts from 1% of turnover. That’s no small figures not everyone can afford. An SAP Hybris price model involves the annual license fee. The payment size is influenced a lot of factors like a number of users, revenue, out-of-the-box features and discounts if you already use SAP suite solutions (SAP ERP, CRM, etc.). You can diminish development costs largely with outsourcing vendors. It turns out that the enterprise-honed Hybris and the payment thereof are a luxury few can afford. Pricing packages of Shopify are aimed at B2C retailers of any level starting from $29 per month and a free trial period of two weeks with the basics to start a new business. They invented Shopify Lite for lovers of Facebook with an opportunity to sell with $9 investments per month only. The red-hot is a middle plan of $79 for retailers with sustained growth of the business. A monthly fee of $299 waits for ambitious entrepreneurs to scale up with advanced package. Enterprise-grade solutions are available for those who are ready for scalable growth at an exponential rate with Shopify Plus. Prices are not publicly available. You will have to inquire your plan feeling the web form. Shopify has payment gateway fees, also. Moreover, almost each Shopify integration also has a monthly fee. E-Commerce platforms are selected by the abundance of available features, but at the same time, lots of advanced options remain in short supply out of the box. The most demanded Hybris acceleration addons, for example, are available in the SAP Hybris Product Extensions market sorted by four core SAP products. Those being overlooked still can be connected too by any experienced SAP Hybris developers. Default Hybris integrations are the whole range of SAP solution, Data Hub for data integration to scale up, ECC (ERP), CSV, ImpEx. Find out more about sales acceleration addons in Hybris systems. Salesforce makes it easy to make up the shortfall of native features with LINK marketplace of integrations. For example, if you seek tax providers to connect to your Demandware-based store, user-friendly navigation will help you to filter by technology and find what you want. Tag tips show you an area of application to facilitate your choice. Salesforce cared about clients it targeted on and displayed a consulting vendor list tagged by regions, as well. It looks like a compensation for the lack of information about default integrations. Shopify can boast of the variety both default integrations and availability of extensions through APIs. The platform has in its basket MailChimp, KISSmetrics, QuickBooks and other tools to sell, make marketing campaigns, analyze, and manage finance and accounting focused on making it as simple as possible. AppStore (digital market of apps and extensions) considerably enhances the capability of Shopify-based e-Commerce store with integrations sorted by category, price, popularity, and collection. Our clients put a user data management at a high level as well as large scalability of the platform so necessary for big market players. Hybris fits well for large development organizations and is perfect for a quick start with enterprise e-Commerce project. You may appreciate a number of solutions on default such as a responsive storefront, CMS, order management, reporting, B2B/B2C Accelerator, etc. SAP Hybris covered the most popular customer journeys releasing you from doing customizations to a bare minimum. Out-of-the-box (OOTB) features (promotions, gifts, payment, tax, shipping solutions) make the development time more efficient. In a pair of SAP Hybris vs Salesforce, the latter cedes superiority of brilliant omnichannel capabilities to the absolute winner. YaaS opens many e-Commerce opportunities for business; starting with a local retailing it is able to support your online presence abroad keeping based on the same software with an established mechanism of operation. We scaled a website on Hybris for one European net of drug stores with an international focus. A country branding (localization for multinational trade) as a key selling point of Hybris gets duplicated the functionality of the parent site. It goes faster and takes from 120 hours per country for implementation depending on the required changes. Estimate of features for B2B website is in our article with a country branding development cost for SAP Hybris websites. Hybris suits perfectly middle and large retail businesses apart from small companies. It requires the technical resources in-house or outsourced to a dedicated development team. The cost of skilled Hybris developers is not low reasonably. To ensure a right project kick-off, it does make sense to provide yourself with a proven implementation partner. Quick set up of an enterprise-level e-Commerce platform. Only one working day and you have an environment for online trading. All that’s left is to connect extra tools. A wide variety of OOTB features for B2B2C retailing. Hybris was initially conceived as the B2B platform, but it extremely succeeded for B2C then too. Scalability for unlimited growth. With Hybris, you should stock up servers and be ready to dispatch goods in great numbers. Believe us we know what we are talking about. Personalized support is hard to get from SAP Hybris. You should find a reliable software vendor and the challenge will be solved. Reliable partner. You may be confused with a lack of resources, but it is on the first glance only. Try to discover Eastern Europe, and you will find an oasis of dedicated developers. Proper documentation and community support have a proprietary product only. We know that users of Hybris e-Commerce platform suffer from a lack of supporting documentation. That’s why we try to share missing explanatory guides via posts in the Aimprosoft’s blog. In the raw of SAP Hybris Commerce, people in business consider Salesforce and Shopify as alternatives. Let’s proceed with Salesforce. While Gartner predicted growth of digital commerce platforms up to $8.5 billion by 2020, Salesforce decided acquiring Demandware is the way to go. What are the features of a newborn Salesforce Commerce Cloud which users are fond of? Undoubtedly, the list will open a strong focus on sales representatives whatever Tom Ebling says concerning its customer focus. The platform is pretty good at building business rules for custom marketing and promo campaigns. Excellent performance of the platform paired with omnichannel capability for B2C intensifies Salesforce commerce suite. CRM customer data is available for users in combination with B2C commerce to get a complete interaction history of every single customer. Retailers command the platform for its prospecting and analytics and highlight the way information is organized. Sales reps have there a healthy sales pipeline visibility. They can manage deals more efficient in that regard. Moreover, they can view a full inventory besides that shown to the clients and upsell with related goods. Salesforce Commerce Cloud is not good for growing mid-tier companies which are frugal in spendings. And multisite management option available from a single backend with a quick set up of a new website will stimulate business owners for more. Their AppExchange marketplace reduces resorting to the development providing customized solutions up to anybody’s taste. 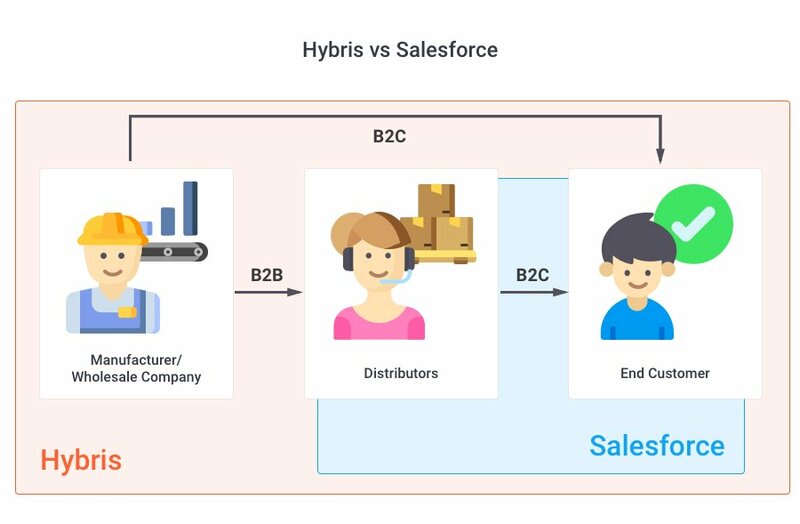 In Salesforce vs Hybris comparison, they share the top rung on the ladder concerning availability and ease of integration of third parties. Treatment of leads. It has an outstanding sales-driven engine to track the lifecycle of leads, opportunities that to cherish the prospects with automated campaigns. Predictivity, reporting, and analytics with Einstein. It has a strong AI and machine learning mechanisms which work with consumer behavior and provides the granularity of data. Sales income percentage. Demandware was designed initially to serve big players and free them from technical issues at all. It works. B2B opportunities are a strong point for Salesforce while it is a natural option for SAP Hybris. Poor community support. In other words, outsourced Demandware developers have to mine support from their experience in the main. Cost. It is really overpriced for small and mid-tier businesses. When Shopify was created, nobody of founders didn’t even suppose the platform able to someday process up to 4 mln inquires and 10 thousand of purchases per second. Shopify isn’t in a core of our portfolio, but we have been delivering Shopify development services for small to medium business upon request. As we experienced, customizations and connections are a common thing while development of new plugins is ordered very rarely. Shopify owners can extend their stores buying plugins and widgets at AppStore and order only integration services from e-Commerce vendors. The platform is mainstream among mid-level stores. It scores with product catalogs, CSV import, a compilation of all data in one place, and rather simple content management where no extra tools required. In a round Hybris vs Shopify, the first one is unquestionably stronger with order management. But at the same time simplicity is everything. Due to its SaaS model, Shopify is easy for non-tech users and doesn’t require permanent maintenance. Shopify becomes a serious contender with a drop shipping option, dozens of payment gateways, automatic taxing, and carrier shipping rates. Add to all that a classy consumer-oriented frontend and you will have a perfect selling machine to go online, getting a payback faster will be profitable. Plugins. The app market is teeming with addons designed by enthusiasts to extend the core functionality of Shopify. Ease of use. Besides, Shopify is technology-ready, it is very user-friendly and intuitively comfortable to work with it. Low-cost business launch. For those who unpretentious in options, it is a good start with a basic set of features for a reasonable price. Shopify is ill-designed for stores with a wide variety of goods. Poor out-of-the-box categories. If you want to diversify your store with advanced filters and categorize products, to add a plugin is the only way. Businesses are limited by customizations of checkout and dynamic pricing with Shopify. Special requirements can be met with an advanced plan or addons only. Hybris vs Salesforce vs Shopify: what to choose for your e-Commerce project? As you can get from this brief overview, every single system has its pros and cons. Whatever you choose for your e-Commerce project if it is Hybris, Salesforce or Shopify depends on what you have at the moment and your ambitions for future. Selecting the platform for yourself, listen to yourself and you will cope with it. If you need a simple, modest but attractive online store, draw your attention to Shopify. In case you want to make a shift from your outdated platform to the B2B adapted one, SAP Hybris is here with all that series of solutions for scalable merchandising. And at least, if you are a stubborn achiever who had gone beyond all possible borders in your niche opt for Salesforce; its Demandware e-Commerce system is exactly what you were looking for. If you want to have a live talk with experts, no problems. We are open.